The application is available under the terms of the GPLv3 open source license and runs on Linux, Mac OS X (64bit) and on Windows 2000 or later. Automatic downloading of maps from OpenStreetMap. Visualize existing location information by showing your photos on a map. Set or modify geolocation information by dragging pictures on the map. Visualization of GPX and KML GPS tracks. 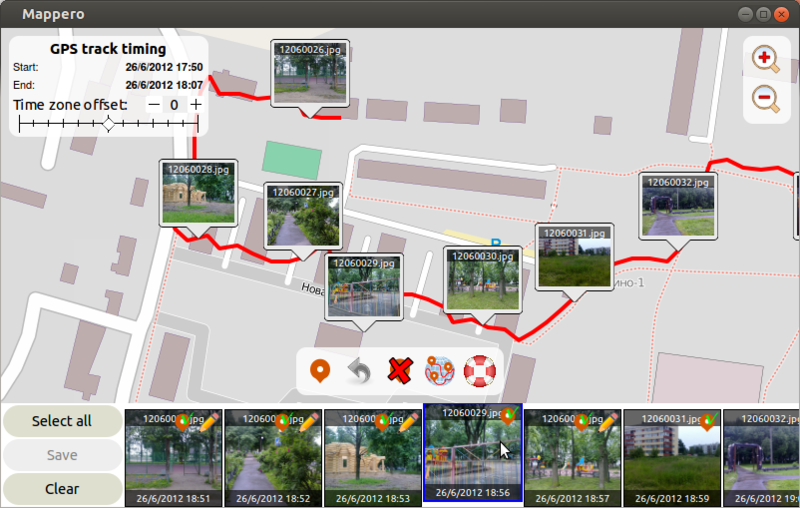 Automatic assignment of location information by correlating the time of the photos with the times of a GPX track (this process is often called correlation). Graphic visualization of the photos on the map during the GPX correlation operation, with controls to specify time zone offset and fine-grained time adjustment. Mappero Geotagger supports all file formats supported by libexiv2; a list can be found here, but it seems to be outdated: more formats than those are actually supported (at least, I found that Mappero Geotagger can successfully geotag Sony ARW images). The mandatory screenshot: Mappero Geotagger correlating images! Any bugfix release: from time to time I might release some new versions which fix any found bugs; I will make these available to you. Access to the Mappero Geotagger mailing list: there you can ask for support on how to use the software (but belive me, it's very easy! ), you can report any bug you found, suggest new features and be notified of new releases. The GPLv3 license, which Mappero Geotagger uses, allows you to re-distribute the software, as long as you also redistribute the source code. You are very welcome to share the application with your friends, indeed — just please remind them that I would appreciate a donation. Remember, the more donations I get, the more I feel committed to improve this software! Why do I say “donations”? Simple: because you are free to donate any amount you wish; chances are that you already got Mappero Geotagger in your hands, since it can be freely redistributed, therefore any donation is welcome. Just please notice, if you want to download the software from this site, you must donate at least the amount described in the paragraph above. Any other donation amount will give you access to the mailing list, where new releases will be announced and where you can ask for any help in using the program, report bugs and suggest features. In case you pay by bank account, please remember to write a mail to shop@mardy.it with the details of your payment (please mention "Mappero Geotagger" in the subject in order to avoid the spam filters). It might take me a few days (up to three working days) to get back to you after I've received the payment, so please be patient. Important notice: please do not share your mardy.it account information with anyone!. While you are free to redistribute the software, please do not do that by using my web server's limited resources (you probably already noticed how slow it is); should I detect that you have shared your mardy.it username and password with other people, your account will be deleted. The post must be public (visible to all). The post must be written originally by you; re-sharing or re-twitting won't be considered valid for this promotion. The post must be somehow related to Mappero Geotagger: a twit like "My dog has died" with a link to this site won't be appreciated. Please use your common sense. Make a donation of at least 10€, and in the message write the link to the post, so that I can have proof of it; if you forget about it, or realize that you wrote a wrong link, write me a message at shop@mardy.it (please mention "Mappero Geotagger" in the subject in order to avoid the spam filters). The post must be written originally by you. The post must be related to Mappero Geotagger. The post must tell readers not to ask you to share your copy of Mappero Geotagger (though you are free to share it, in fact). The post can be in any language (of course, interlingua es le lingua preferite!). Make a donation of at least 5€, and in the message write the link to the post, so that I can have proof of it; if you forget about it, or realize that you wrote a wrong link, write me a message at shop@mardy.it (please mention "Mappero Geotagger" in the subject in order to avoid the spam filters).